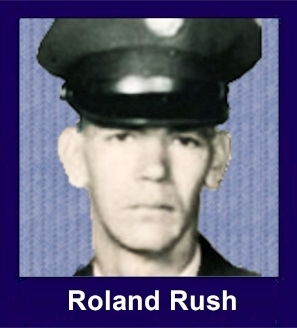 The 35th Infantry Regiment Association salutes our fallen brother, PFC Roland Edward Rush, who died in the service of his country on May 20th, 1967 in Quang Ngai Province, Vietnam. The cause of death was listed as Small Arms/AW. At the time of his death Roland was 21 years of age. He was from Kensington, Georgia. Roland is honored on the Vietnam Veterans Memorial at Panel 20E, Line 67. The decorations earned by PFC Roland Edward Rush include: the Combat Infantryman Badge, the Silver Star, the Purple Heart, the National Defense Service Medal, the Vietnam Service Medal, the Vietnam Campaign Medal and the Vietnam Cross of Gallantry with Palm Unit Citation. This is my Uncle. My mother's brother. He was taken from my family in May of '67, before I was born. Cut down, by an enemy machine gun, in the prime of his life at 21, while walking point on a patrol. He could have avoided being drafted, had he wanted to. He was 6'8, the only son, and was determined crippled in his right hand, yet he chose to go and serve his country, when it called. He payed the ultimate and supreme sacrifice for a country who didn't care, in a country that didn't appreciate his being there. He is missed, but I will assure you and his memory, he will never be forgotten. For gallantry in action while engaged in military operations against an armed hostile force in the Republic of Vietnam. On 20 May 1967 Private First Class Rush distinguished himself while serving as a Rifleman in C, 2/35th Infantry; conducting a search and destroy mission near Duc Pho. As members of his squad maneuvered against the stubborn, entrenched enemy, a grenade was hurled at them from a concealed bunker and landed between two of his comrades. With no thought of his own life or safety, he pushed them to the ground and threw his body between them and the grenade, absorbing some of the explosion and saving the lives of the two men. Though seriously wounded, he began firing and throwing grenades at the enemy positions. Then he jumped to his feet and charged the enemy position, spraying it with bullets and keeping himself between it and his two comrades. Just as he reached the bunker, the single enemy survivor of his attack shot at him and inflicted a mortal wound. Private First Class Rush's selfless gallantry is in keeping with the most cherished traditions of the military service of the military service and reflects great credit upon himself, his unit, and the United States Army.